Use primary sources to enhance your study of ancient history. 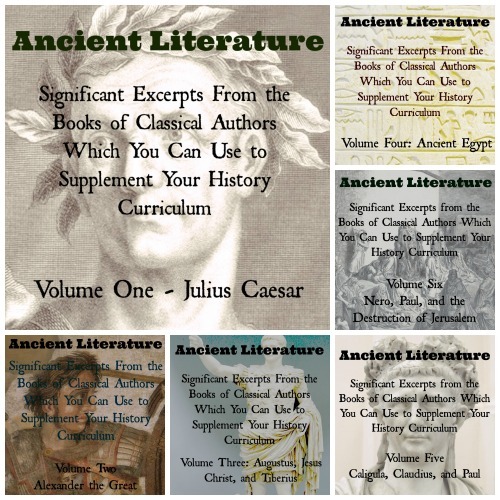 This 94-page ebook can be used to supplement any ancient history curriculum and is suitable for ages ten through adult. For this volume, we combed through the books of twelve ancient authors to find 44 significant excerpts concerning Alexander the Great. We then arranged the excerpts chronologically and provided the text and citation for each. he sent for the most famous and learned of philosophers, Aristotle, and paid him a noble and appropriate tuition-fee. 3 The city of Stageira, that is, of which Aristotle was a native, and which he had himself destroyed, he peopled again, and restored to it those of its citizens who were in exile or slavery. 8 Moreover, in my opinion Alexander’s love of the art of healing was inculcated in him by Aristotle preeminently. For he was not only fond of the theory of medicine, but actually came to the aid of his friends when they were sick, and prescribed for them certain treatments and regimens, as one can gather from his letters. 2 He was also by nature a lover of learning and a lover of reading. And since he thought and called the Iliad a viaticum of the military art, he took with him Aristotle’s recension of the poem, called the Iliad of the Casket, and always kept it lying with his dagger under his pillow, as Onesicritus informs us; 3 and when he could find no other books in the interior of Asia, he ordered Harpalus to send him some. So Harpalus sent him the books of Philistus, a great many of the tragedies of Euripides, Sophocles, and Aeschylus, and the dithyrambic poems of Telestes and Philoxenus. 4 Aristotle he admired at the first, and loved him, as he himself used to say, more than he did his father, for that the one had given him life, but the other had taught him a noble life; later, however, he held him in more or less of suspicion, not to the extent of doing him any harm, but his kindly attentions lacked their former ardour and affection towards him, and this was proof of estrangement. 5 However, that eager yearning for philosophy which was imbedded in his nature and which ever grew with his growth, did not subside from his soul, as is testified by the honour in which he held Anaxarchus, by his gift of fifty talents to Xenocrates, and by the attentions which he so lavishly bestowed upon Dandamis and Calanus. ….6 But, for all the problems and fears that beset his kingdom on every side, Alexander, who had only just reached manhood, brought everything into order impressively and swiftly. Some he won by persuasion and diplomacy, others he frightened into keeping the peace, but some had to be mastered by force and so reduced to submission…..
4 In order to overawe those who refused to yield otherwise, he set out at the head of the army of the Macedonians in full battle array. With forced marches he arrived in Boeotia and encamping near the Cadmeia threw the city of the Thebans into a panic. 5 As the Athenians immediately learned that the king had passed into Boeotia, they too abandoned their previous refusal to take him seriously. So much the rapid moves and energetic action of the young man shook the confidence of those who opposed him. 6 The Athenians, accordingly, voted to bring into the city their property scattered throughout Attica and to look to the repair of their walls, but they also sent envoys to Alexander, asking forgiveness for tardy recognition of his leadership. 7 Even Demosthenes was included among the envoys; he did not, however, go with the others to Alexander, but turned back at Cithaeron and returned to Athens, whether fearful because of the anti-Macedonian course that he had pursued in politics, or merely wishing to leave no ground of complaint to the king of Persia. 8 He was generally believed to have received large sums of money from that source in payment for his efforts to check the Macedonians, and indeed Aeschines is said to have referred to this in a speech when he taunted Demosthenes with his venality: “At the moment, it is true, his extravagance has been glutted by the king’s gold, but even this will not satisfy him; no wealth has ever proved sufficient for a greedy character.” 9 Alexander addressed the Athenian envoys kindly and freed the people from their acute terror. 3. …….So Alexander came into Syria, and took Damascus; and when he had obtained Sidon, he besieged Tyre, when he sent all epistle to the Jewish high priest, to send him some auxiliaries, and to supply his army with provisions; and that what presents he formerly sent to Darius, he would now send to him, and choose the friendship of the Macedonians, and that he should never repent of so doing. But the high priest answered the messengers, that he had given his oath to Darius not to bear arms against him; and he said that he would not transgress this while Darius was in the land of the living. Upon hearing this answer, Alexander was very angry; and though he determined not to leave Tyre, which was just ready to be taken, yet as soon as he had taken it, he threatened that he would make an expedition against the Jewish high priest, and through him teach all men to whom they must keep their oaths. So when he had, with a good deal of pains during the siege, taken Tyre, and had settled its affairs, he came to the city of Gaza, and besieged both the city and him that was governor of the garrison, whose name was Babemeses. At this point Alexander from utter weariness had determined to raise the siege and go to Egypt. For after he had overrun Asia with great speed he was lingering around the walls of a single city, thus losing the opportunity for so many mighty exploits. But he was as much ashamed to withdraw baffled, as to delay, thinking that his reputation also, by which he had overthrown more than by his arms, would be impaired if he should leave Tyre as a witness that he could be defeated. Therefore, in order to leave nothing untried, he ordered more ships to be brought up and the best of his soldiers to be embarked upon them. And it chanced that a sea-monster, of a size never before seen, rising even above the waves with its back, brought its huge body up to the causeway which the Macedonians had built, and striking the surges asunder as it lifted itself, was seen by both sides. Then from the peak of the causeway it again plunged under the sea, and now rising above the surface with a great part of its bulk, now hidden as the waves dashed over it, it disappeared under water not far from the walls of the city. The appearance of the monster gave joy to both sides; the Macedonians interpreted it as showing the direction in which to go on building up the work; the Tyrians thought that Neptune, as an avenger of the usurped sea, had brought the monster against the causeway, and that it would surely soon fall in ruins. 5 And as I was considering, suddenly a male goat came from the west, across the surface of the whole earth, without touching the ground; and the goat had a notable horn between his eyes. 6 Then he came to the ram that had two horns, which I had seen standing beside the river, and ran at him with furious power. 7 And I saw him confronting the ram; he was moved with rage against him, attacked the ram, and broke his two horns. There was no power in the ram to withstand him, but he cast him down to the ground and trampled him; and there was no one that could deliver the ram from his hand. 28 Between the Indus and the Hydaspes is Taxila, a large city, and governed by good laws. The neighbouring country is crowded with inhabitants and very fertile, and here unites with the plains. The people and their king Taxiles received Alexander with kindness, and obtained in return more presents than they had offered to Alexander; so that the Macedonians became jealous, and observed, that it seemed as if Alexander had found none on whom he could confer favours before he passed the Indus. Some writers say that this country is larger than Egypt. Above this country among the mountains is the territory of Abisarus, who, as the ambassadors that came from him reported, kept two serpents, one of 80, and the other, according to Onesicritus, of 140 cubits in length. This writer may as well be called the master fabulist as the master pilot of Alexander. For all those who accompanied Alexander preferred the marvellous to the true, but this writer seems to have surpassed all in his description of prodigies. Some things, however, he relates which are probable and worthy of record, and will not be passed over in silence even by one who does not believe their correctness. Other writers also mention the hunting of serpents in the Emodi mountains, and the keeping and feeding of them in caves. 89. Many were slain in their flight, but then Alexander, satisfied with his brilliant victory, ordered the trumpets to sound the recall. Of the Indians, there fell in the battle more than twelve thousand, among whom were the two sons of Porus and his best generals and officers. Above nine thousand men were taken alive, together with eighty elephants. Porus himself was still breathing, and was turned over to the Indians for medical attention. On the Macedonian side, the losses were two hundred and eighty cavalry and more than seven hundred infantry. The king buried the dead, rewarded those who had distinguished themselves in accordance with their deserts, and sacrificed to Helius who had given him the eastern regions to conquer. There were mountains not far away where grew thriving firs in quantity, together with no little cedar and pine and an ample supply of other woods suitable for shipbuilding, and Alexander constructed a large number of ships. He intended to reach the borders of India and to subdue all of its inhabitants, and then to sail downstream to the Ocean. He founded two cities, one beyond the river where he had crossed and the other on the spot where he had defeated Porus. These were built quickly because there was a plentiful supply of labour. When Porus had recovered, Alexander appointed him, in recognition of his valour, king over the country where he formerly ruled. The Macedonian army rested for thirty days in the midst of a vast plenty of provisions. 90. Odd phenomena were observed in these mountains. In addition to the wood for shipbuilding, the region contained a large number of snakes remarkable for their size; they reached a length of sixteen cubits…..Sasibisares, the king who had not moved in time to help Porus in the battle, was frightened, and Alexander forced him to accept his orders. Then Alexander resumed his march to the east, crossed the river, and continued on through a region of remarkable fertility. It possessed strange kinds of trees which reached a height of seventy cubits, were so thick that they could scarcely be embraced by four men, and cast a shadow of three plethra. This country possessed a multitude of snakes, small and variously coloured. Some of them looked like bronze rods, others had thick, shaggy crests, and their bites brought sudden death. The person bitten suffered fearful pains and was covered with a bloody sweat. The Macedonians, who were much affected by the bites, slung their hammocks from trees and remained awake most of the night. Later, however, they learned from the natives the use of a medicinal root and were freed from these fears. This entry was posted on Monday, March 18th, 2019 at 5:56 pm	and is filed under History, Literature. You can follow any responses to this entry through the RSS 2.0 feed. Both comments and pings are currently closed.